Last fall the family team of bloodstock agent Bob Feld, his son Sean Feld, and trainer Mark Feld, put a name to a concept they had been testing since Bullet Train—half brother to European champion Frankel—retired to stud in 2013. Climax Stallions is the Felds' new stallion syndication venture that is modeled more similarly to racehorse syndications. BloodHorse MarketWatch editor Eric Mitchell talked with Sean Feld about the new company, which is now recruiting investors for its most recent acquisition, grade 1 winner Haynesfield. 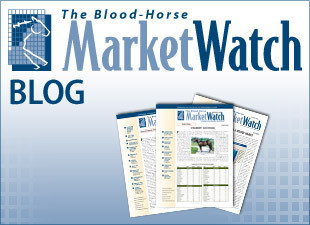 BloodHorse MarketWatch: Where did the idea for Climax Stallions originate? Sean Feld: Bullet Train was our guinea pig. We were looking for a way to attract non-horse people, so we got a lot of professional business types who watched horse racing and gambled on the weekends but had never owned a horse. That went pretty well so my uncle Mark saw this opportunity to get people involved in the game on the stallion side instead of through pinhooking or buying a small piece of a racehorse. BH: How does your stallion syndication differ from more traditional stallion syndications? SF: The minimum buy-in is 10%, and you don't get any breeding rights, which fits with our target audience that doesn't own mares. You just own a 10% equity in the stallion. Our goal is to use stallions that can stand on their own merit and don't need a lot of inside support. There is power in numbers, but we feel if you can find the right stallion for the right price, then we'll get enough mares regardless of who owns him. Investors are responsible for 10% of the expenses and entitled to 10% of the profits. We are selling the dream that Haynesfield or Curlin to Mischief could be a good cash generator if they hit. Your initial costs are less and your risk is less than with a racehorse in training. BH: Action is a key attraction in owning a racehorse. Can a stallion syndicate investor get the same rush? SF: Certainly owning a racehorse is the most fun, but we feel there is still a lot of action with the stallions. My uncle, who (races as) Lucas Downs, is an action junkie. He likes the stallion thing because with Bullet Train, for example, he had 45 2-year-olds last year, so he feels he owns a piece of every one of his progeny. BH: Why did you decide to acquire Haynesfield last fall? SF: Bullet Train and Curlin to Mischief are sold out. The luxury with Haynesfield is the investor doesn't have to wait like he does with the new guys. Haynesfield has had four crops and averaged over 90 mares a year his first four years at stud. Since we bought Haynesfield, we've been tracking the entries and he's got one or two every day. It is a lot of action for someone who is a novice. And the timing was good. He had an impressive maiden winner at Fair Grounds Jan. 8 in Midway Gold. We're pretty excited about him.